The Economic and Financial Crimes Commission (EFCC) has denied news that it raided the homes of two sons of the People’s Democratic Party (PDP) presidential candidate Atiku Abubakar. The Cable reports that the commission, in a statement, described the news as “tales by moonlight.” It was the home of Theodore Orji‘s sons that were searched, the statement read, and the people arrested had nothing to do with Atiku’s sons. We have received several calls and email messages asking us to confirm the arrest of the sons of the Presidential Candidate of the People’s Democratic Party, Alhaji Atiku Abubakar, as being alleged in some quarters. Some only said we raided the apartments of Atiku’s son’s looking for foreign currencies. This is nothing but another tales by moonlight. It is in the news that we have been investigating the former Abia governor, Senator Theodore Orji over alleged N27 Billion Naira money laundering. In the course of the investigation, we discovered that he laundered part of the money through his sons. We have been on the trail of some of the purchases made by his son including the cars the boys allegedly bought. Last Friday, we traced one of the cars to a Nite Club in Abuja. In order not to cause panic, we waited until the business of the club was over and when the owner of the suspected car came to enter to take off, we arrested him and his friend who has a similar brand of car. That was about 5am on Saturday, December 8, 2018. The two boys we arrested were Ogbonna Orji, 32, and Kelvin Ilonah. While Orji’s Car, a Range Rover is valued at about N100 million, Ilonah’s car also a Range Rover, is valued at about N35 Million. 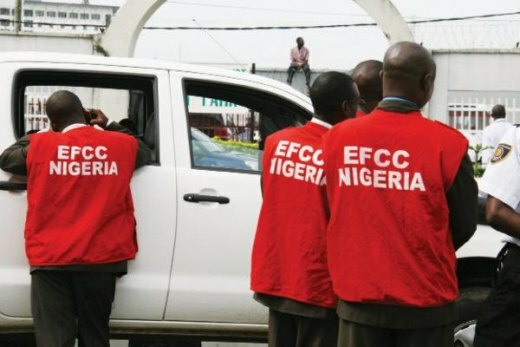 In the course of further interrogation, the two boys led us to their apartment, three flats, and documents retrieved from the apartment showed it was rented for N13 million each per annum. Another brand new Prado Jeep, a 2017 model was recovered from the boys in the compound. The two boys in question gave useful information to the Commission which is helping in our further investigation. The EFCC, as a responsible organisation is abreast of the establishment mandate and we shall not deviate from such mandate. We never went after Atiku’s sons neither were Atiku’s sons among the two boys arrested. There is no link whatsoever to Atiku. Only last week, the Peoples Democratic Party (PDP) was alleged to have raised an alarm that the Commission blocked and or freeze the accounts of the Vice Presidential candidate of the PDD, Peter Obi. Again, this was another lie which we immediately punctured as there was no truth in it whatsoever, to the accusation. Till now, only silence has prevailed from the camp of the accusers.